Are you worried that your retirement savings and social security aren’t going to be enough to support you when you’re not working anymore? Are you thinking about moving to a cheaper place for retirees so you can get more for your money? If you’re American, you’re not alone if you’re not in great financial shape. Wages have been stagnant for a long time except for the top 1% and health care costs keep rising dramatically in our current for-profit system. If you live in a hot market–which these days extends to mid-market cities like Nashville and Portland—you’ve seen housing prices go up crazy fast. Rising housing prices are not just a stateside problem: the cost to rent (if you downsize during retirement) has also skyrocketed in Canada, the UK, Ireland, and Australia. The best way to combat these trends is to change your address. If you move somewhere that has a cost of living half what you’re paying now, you’re clearly going to have a more comfortable retirement. Life gets a lot better if you’re not spending thousands a month just on housing and healthcare—the latter even more of an issue if you retire early or have lots of prescription drugs to pay for. There are still plenty of cheap places to live in the USA, but when you look at those lists of the best bargains they aren’t exactly the most desirable towns around. You see cold rust belt towns (Toledo, Akron, Ft. Wayne, Rochester) and small southern towns without a lot of culture or activity (Harlingen, TX; Hattiesburg, MS; Stageboro, GA). The best bargain cities tend to be in the deep south or in farm country (Birmingham, Jackson, Shreveport, Omaha, Des Moines, Tulsa, Lubbock.) If one of those places gets you excited, you might want to look into a domestic option to bring down your expenses. Just be advised that it won’t be a dramatic drop unless you’re in a very high-priced area now. The savings are likely to be in the 20%-25% range if you’re in an average-priced U.S. market for housing. After all, prices for medicine, food, gasoline, and insurance aren’t likely to change much if you stay within your own country. The most dramatic way to cut your costs in a deep way though is to opt out completely and reset your reality. My costs drop by more than half when I move to Mexico yet I live in a far less frugal manner there: we have a twice-weekly maid, a handyman on call, we go out more, we travel more domestically. It truly is a Better Life for Half the Price. 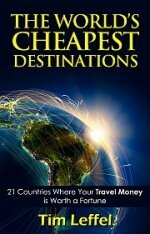 Plus there are much cheaper places to live than Mexico, so you could potentially cut your costs by 2/3 rather easily. When your rent and health care costs drop by that much or more, you’ve got some of the biggest line items reduced. Outside of the USA and most of Canada, it’s easier to get by without a car too, so that’s another big expense you can reduce dramatically. Just take a taxi or Uber-equivalent when the public transportation is not enough. If you subscribe to International Living, you get an ongoing stream of useful articles with tips and real prices for retiring abroad. It’s hard to completely trust all their advice since the magazine and website are just gateway drugs to get you to purchase expensive seminars and buy from their real estate partners. The aggressive sales pitches get old fast and you’ll notice that their online articles don’t link out to any other sources, which is always suspicious. However, they do put a lot of effort into their annual Retirement Index, which combines some real data with their opinions to figure out the best options for retirees. They look at factors like weather, healthcare, quality of life, and ease of moving there. Price is just one of the factors in their index, so if you’re on a budget you might have to disregard a few of them right away. The top recommendation on their index is to retire in Costa Rica, for instance, which feels surprisingly expensive to me every time I visit. (See Sorry Kids, but Costa Rica Is No Bargain.) It’s a fantastic country to visit, but real estate costs can be on par with the USA, especially on the coast and in the nicest part of the capital city. Labor costs, food costs, and transportation can all cost twice what they do in Nicaragua, Guatemala, Honduras, or even Panama. On the plus side, $1,000 a month in income per couple is enough to apply for residency and you can join the national healthcare system. Medical costs are a good value here and the country is known as a dental tourism destination. I’m always amazed that more foreigners haven’t settled down in Peru, at least the location independent types. You can stay for 180 days on a tourist visit, take a vacation in some neighboring country, then start the process over again. If you’re a retiree who wants to travel more, this will get you off the couch and you’ll return to a half-priced life by the Andes Mountains. See my video interview with Nora Dunn when she was living in Pisac. If you want to retire in Peru, there are lots of spots with a nice climate, verdant soil for gardening, and great food when you go out to eat. I recently updated this post on the cost of living in Portugal, getting current info from expats living there. If you have your heart set on Western Europe but don’t want to pay normal European high prices, this is your spot. You get great wine and food, a sunny and warm climate, and developed-world infrastructure and cleanliness. It’s not as easy to live a half-priced life here as some of the others on the list, especially in Lisbon, but it can be done. Just be prepared for a long and patient slog getting residency if you’re not from Europe. International Living also had Spain on their list, but every independent rundown I see shows prices are significantly higher in Spain than Portugal, especially on the coast. Malaysia is a good choice for people who want a tropical climate where they can get by in English. The food is great, with a mix of three cultures, and residency is straightforward if you’re willing to invest in property there. Rents are affordable if you don’t want to get tied down though and it’s easy for a couple to live well here on the equivalent of two social security checks. You’ll seldom pay a “foreigner price” here for goods and services, including a $4-5 an hour maid. You can live in a vibrant capital city (KL), in the foodie mecca of Georgetown, or in the old colonial city of Malacca. There are plenty of spots where you can live at the beach as well. With Nicaragua out of the picture for now, this may be the cheapest country south of Guatemala for retirees. Ecuador has long been popular with retirees who don’t have enough money in the bank to live comfortably in the USA or Canada anymore. With $700 houses for rent, $3 lunches, and good medical care, Cuenca has been a retirement hotspot for close to two decades running. Other retirees are scattered across the country in different areas though, from Cotacachi north of Quito to Vilcabamba in an Andean Valley to coastal towns where you can buy a condo with an ocean view for the cost of a double wide trailer in the USA. I have a hard time recommending Panama as a retirement destination to people who haven’t traveled much because the country is such a mixed bag in terms of living costs. Panama City is a true metropolis, with towering high-rises, cranes everywhere, heavy traffic, and luxury condo prices. It seems reasonable there when you go out to eat or go grocery shopping, but there’s so much money floating around that it just feels like a discounted Miami. Head south to Boquete, David, or Bocas del Toro, however, and it can be a different story, with more Panamanian prices. If you’re the rural homestead type, then you can get a house with some land and really cut your costs. Panama is very similar to Costa Rica in terms of protected areas, wildlife, and adventure activities, but without millions of tourists coming through each year, plus prices in dollars, it feels like a much better value. This is especially true if you like to drink booze or wine for cheap. This has been my home off and on for several years and from 2019 onward will be my permanent base. So obviously I like it as a place to live. I’m not of retirement age yet though and that’s fine—Mexico doesn’t really give you any benefits as a retiree anyway. Plus they have a much higher income requirement than any country south of them. So why do so many retirees flock there? Well it’s close, first of all, with terrific air connections. From some spots those flights aren’t much more than a U.S. domestic one. The people are gregarious and forgiving of your bad Spanish, the food has more variety (and kick) than anywhere else south of the USA, and what you get for your money is really a great value. Great value doesn’t mean “cheapest” of course, but in the coastal areas you can find a nice apartment on par with what you’re used to in terms of amenities. Mexico is no bargain if you’ve got your heart set on Puerto Vallarta or Cabo San Lucas, but other parts of the country are much more reasonable, even on the coasts. You can still find a beach house for under $100K if you know where to look. We sold ours a few years ago near Progreso for $56K. Here’s what it costs to live in Central Mexico, where I am and the other similar cities nearby. I highlighted Nicaragua in my last rundown on the cheapest places to live in the world. This year though, the country has been a mess as fights between a fed-up population and the autocratic government clinging to power have led to hundreds of deaths. Business and tourism have plummeted. Many expats are staying put, but it’s not the best time to move there. When things return to normal, Nicaragua has one of the lowest bars to entry anywhere for income needed to get residency. Part of the reason more European and Asian countries don’t show up in the IE top-10 and others is because of visa restrictions. While an EU resident can easily retire in Bulgaria, Hungary, Portugal, or the Czech Republic, for example, Americans and Canadians have to go through reams of paperwork and lawyers’ fees to make it happen. Where there’s a will and a bit of cash, there’s a way, however, in countries where your income is well above the local average. And as hard as it may be to believe, $2,000 for a couple will make you upper class in some places. If you have twice that coming in, you’re downright rich. You don’t hear a lot of people besides me talking about retirement in these countries, but they’re the cheapest spots in Europe right now, along with Bulgaria below. Albania is especially attractive and I think it’s in a place right now where Portugal and Ireland were 20 or 30 years ago in terms of the coming demand once the word gets out. It’s sunny and warm much of the year, with a coastal climate across the Adriatic from Italy, just below (more expensive) Croatia. You’ve got plenty of time to try it out if you’re American: you can get a tourist visa good for a whole year. There’s no other country in the world that will give you that. Tirana is one of the most chilled-out capital cities I’ve even been in and it’s easy to fine a nice apartment for less than $500 a month pretty much anywhere in the country. Montenegro is a bit strange, with a huge number of tourists around the Bay of Kotor, then almost none in the rest of the country. Some of the beach areas are popular with Russians and domestic tourists, but few others. So you may deal with a bit of a language barrier here if you don’t speak Russian. There’s a lot to choose from at bargain prices though when it comes to housing. Bosnia and Herzegovina still haven’t gotten to the wage level they were at before the war, so if you come into that country to put down roots with $2,000 a month to spend, they will be very happy to see you indeed. This is a great country for hiking, rafting and mountain biking, if you’ve still got the mobility for outdoor adventures. Otherwise, the food and the beer are good and cheap. I have a strong feeling I’ll be spending months on end here at some point in my golden years. It won’t be in the winter though unless I come here to ski. This is not a place you go for year-round sun and warmth. There are beaches on the Black Sea coast though and it’s crazy cheap to buy a house here—as in less than a used Toyota—if you’re handy or are just enticed by a great bargain. In the warm months, the country is filled with forests to explore and you can drink wine and beer for very little money. This is probably the cheapest place to retire in Europe overall. Alas, the easy one-year business visas you could get by just paying a shade over $200 are gone for now, so you’ll probably have to venture outside the country every three months or so unless you get some kind of a job and a work permit. Eventually there may be an official retirement program, but what you have now is a 6-month or 12-month “ER Visa Extension” for retirees. You must be 55 or older and there are some reports of having to show “proof of retirement,” which seems to mean you would need to be old enough to get a pension or social security. It’s a shifting landscape in Cambodia. There are plenty of retirees at the beaches and in the capital, but you have to sift through the sexpats to find a clean community for couples or single women. The good news is, this is one of the cheapest countries in the world for travel or living. Here’s a rundown on living costs. While Thailand is a pain in the rear to live in without a work permit for most ages, it’s a breeze for retirees if you have some savings. You basically have to buy property or put money in a Thai bank account (800,000 baht, which equates to US$24K to $28K depending on exchange rates) for at least one year, but then you get a retirement visa that allows you to renew indefinitely. The age requirement is 50 or older. You just have to check in with immigration now and then, but it’s an in and out visit. You can also qualify by showing a high enough monthly income, around $3K last time I checked, which can be coming from a pension or a business. Foreigners can’t own land in Thailand, but you can buy a condo, in some spots as low as $25K. Here’s the most thorough rundown I’ve seen with document lists and cost. Check out this link for interviews with expats living in Thailand. I’m always a bit hesitant to put the Philippines in these lists because, like Cambodia and Thailand, it appeals more to older single men than couples or single women. Plus their current president may be the only world leader that’s more unhinged and sexist than our own. There’s no denying that the place is a bargain for retirees who come here and rent, however, plus everyone with an education speaks near-native-level English. Do your own due diligence of course and remember that if you don’t like a place personally, it doesn’t matter where it falls on any “best of” list. It may be the one of the cheapest places to retire, but you might hate it. There’s no substitute for spending real time in a place. Rent a house and see what it’s really like to live abroad there in non-vacation mode. Want to get regular updates on this subject? Subscribe to the Cheap Living Abroad Newsletter. 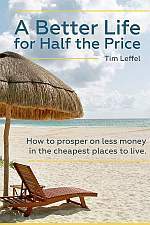 Or just pick up your copy of A Better Life for Half the Price – my book on living abroad for less. Right now the cheapest country in the Americas is Argentina, followed closely by Colombia. Something to keep in mind though is taxes on worldwide income, which both do as do many other countries, possibly avoided in Argentina by doing border runs. Albania is a good deal, but after you spend a year there as an American you must leave for three months or get residency, which subjects you to taxes. Georgia is even cheaper and allows over 70 countries to stay a year on a tourist visa, renewed by just crossing the border and returning. One unique situation I was alerted to recently by a good friend is Poland. Due to a bilateral agreement signed in 1991 between Poland and the U.S., Americans can stay indefinitely by crossing the border of a non-Schengen country like Ukraine or flying to another non-Schengen country like the U.K. every 90 days. Poland is very inexpensive but has a high quality of life with some amazing cities. Gets a serious winter though so maybe a good time to visit family in the States. I just flew cheaply from Sweden to KC through Iceland. Icelandair and WOW Airlines to Reykjavik then on to a number of Polish cities on discounter Wizz Air can get you to and from Poland very reasonably. Saw a flight recently on Skyscanner from Reykjavik to Chicago on WOW for $110 as well as numerous flights on Wizz from Poland to Reykjavik for less than $100(before baggage charges). And there are a number of airlines that’ll get you to Latin America very reasonably too. Whether argentina is cheap or not changes depending on the current crisis level. You can’t rely on it staying that way for retirement. Also Cambodia recently instituted a new visa program that’s very user friendly. True, but they’re having their worst crisis since 2001. Wasn’t very long ago the Peso was around 15:1, now almost 40:1. They have enough systemic issues that will most likely keep them cheap for years to come. An early retiree with a decent income could save some serious money while living comfortably. Numbeo has them just shy of 60% cheaper than the U.S. overall. Not far from India prices. See the Sept. 20 post I put up Wade. I agree it’s a great place to travel right now, but unlike 2001, real estate prices are in dollars now, including rentals. They learned their lesson last time. That doesn’t mean there’s not negotiating power, but I wouldn’t bank on retiring there based on crisis pricing. It was definitely not a bargain when I was there just last October. True, read about rent and sales being in Dollars, which puts a huge squeeze on Argentineans. Which is why I’m waiting to see if this results in serious social unrest before considering going there. My other concern is decent internet. Right now my wife and I are looking at Colombia. Seems to be safe enough in better areas these days and fiber optic internet is being installed in places we like. Echoing what Wade said, just with a bit more meat on the bone: Anyone at least 55 years old can get a retirement visa for Cambodia, no proof of a pension required. A no-BS sweet deal that beats Thailand’s with its financial requirements and 90 day reporting by a mile. Things have become more complicated if you’re younger than that, as a work permit is now required (you can run your own business just as before and get a wp for that (you couldn’t do this in Thailand). I just noticed the following error: “…or put money in a Thai bank account (around $85K)…” . THB 800K = about $24,400 based on today’s rate. You’re right, I fat-fingered that one. 800,000 baht. Their currency bounces up and down a good bit, so I put a range in the correction. This is a good time to deposit money! I have many friends in Cambodia now. It’s a mixed bag there. Hospitals and medical services are terrible. Cheap living, but it’s a tough life. Not for everybody. Cheap to get to Bangkok though for some of the best hospitals in the world. We visited Spain and Portugal last year for a month and were very surprised at the low costs. Obviously higher than some of the other countries on this list, but since we have a kid we also have to consider schools. Loved the weather and the vibe in Cordoba and Sevilla. Lisbon felt like a paradise for expats and I’ve heard there are some other great cities in Portugal as well. What about India or Nepal? For Americans, there’s no retirement visa in either, but India makes it easy to live there long-term with a 10-year multi-entry visa. Nepal doesn’t have anything like this, so you basically have to get a job there (like with a NGO) in order to stick around. Thanks for sharing Such important information. it is really useful to those who are traveling to the destinations like this. Love that pic of Veliko Tarnovo in Bulgaria. Lovely town. We enjoyed that view many nights. We enjoyed our 2 week visit there. I really want to go back there for longer. Loved that town! Forgot to mention Peru has clamped down on border runs. They’re enforcing 183 days maximum in a calendar year, but they do have visas you can apply for to stay longer. Have you had this happen personally, or do you have a link? Send more info if so. I’ve got contacts there still popping over the border and back, so far so good. They usually go on vacation though, not a same-day crossing. Hi Tim. It’s what everyone is saying on ExpatPeru and Expat Exchange forums. That Peru has gotten serious in the last year and max 6 months per calendar year is being allowed. Beyond that need a visa. If you are correct I’d give Arequipa a try. But literally everyone is saying this is now the case. OK, I’ll do some digging and update. Bummer if so because the long-term visa situation there is not so straightforward. Which is why there are so few expats there compared to neighboring (much smaller) Ecuador. Hi ,, great round up of info ,, ThankYou ,, do You know if the Ecuador residencia criteria of $800 income monthly applies also to UK citizens & is there a lower age limit on that ? (I’m 58 UK citizen) thanks again for all the inspiration & information ! I am not aware of any difference, but you might want to check the local message boards to be sure. This is all great information. Having lived in Nicarauga for 3 years, in the past. I hope the problems there are resolved soon. I will go back once problems are resolved. Currently live in merida mexico, very safe, affordable, friendly people. Would love to try Europe for a taste of life….or South America. I also found International Living to be geared to people who are NOT on a budget. Their information doesnt seem realistic and geared to selling you a home, in a place you know nothing about!!! Tim’s article’s keep it real and simple, for those of us who want reality,with easy comprehension. If you dont understand…just ask!!!! Thanks David. Unlike IL, I have no interest in whether you invest some particular place or not and strongly advise people against buying property until they have lived there a while as renters. Thanks for recognizing that. If you follow the links in the article you will see this is based on actual interviews with people living in the countries, the ones that know the real situation on the ground at this time.